We seem to have formed a bit of a sinkhole blog trilogy. First, we informed you on the 7 Common Signs of Sinkholes. After that, we showed you how you can Test for Sinkholes. Now, in this article, we want to share what to do once you find an air-filled void on your property. The good news is that you’ve already done most of what you need to do at this point. You’ve already done a geophysical survey—such as an Electrical Resistivity Imaging (ERI) survey. So there’s a good chance you’re already talking to a geoscientist. When it comes to underground voids, it’s best left to professionals. Whether it's a geophysicist, geotech engineer, or geological engineer, you’ll want to consult with someone who can perform a geophysical survey and interpret inversion data. It also helps if your geoscientist has connections with local contractors and professionals experienced with voids or karst terrains. This is because you’ll most likely need to do some heavy-duty digging or drilling to fix the void. Then again—depending on your case—you may not have to drill at all. Let’s discuss that last point. Do all underground voids need remediation? Well, it depends. Though there are some commonalities between underground voids, each case is different. Variables like location, development plans, and even the surrounding geology come into play. A remote, unpopulated property with a small void that’s deep underground isn’t a high risk. To be safe, you may want to drill anyway to make a monitoring well and keep an eye on things. However, if you plan to develop the property for real estate or in a populated area—you’ll want to take every precaution. There’s no way of telling how long a sinkhole has been developing underground or when it’s going to subside. As an unfortunate example, a sinkhole swallowed a house in Florida in 2013—without warning in the middle of the night. One of the resident's remains were never found. (Source: CNN.com). Even the White House has had issues with sinkholes (Source: CNN.com). ERI surveys can help mitigate problems like these. Ok, so by now your geoscientist has conducted an ERI survey and knows what you’re dealing with underground. When they review the data with you, the three parameters you’ll want to keep in mind are the size of the void, the depth of the void, and the surrounding geology. 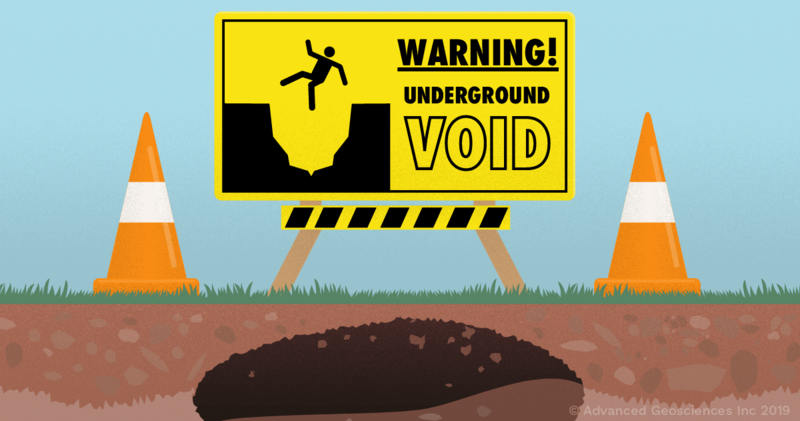 If a void is a few feet or a meter wide—and it’s deep underneath solid rock—it may not be a big risk. If a void is large, near the surface, and surrounded by geology that can crumble or erode—you may have found yourself on the highway to the danger zone. It’s best to go with the judgement of your professional when looking into remediation though. They will have a better understanding of what variables your property faces. The 2D data above comes from a case history from Colombia back in 2013. The black dotted line represents where the electrodes were placed on the surface. It’s pretty obvious in the data where there are underground voids (in this case, the voids were represented by big ominous red blobs). The black dotted line also gives you an idea of how the surface has already begun to sink in the areas near voids. These voids will become what’s called a “cover-collapse sinkhole”. These are the types of sinkholes you’ll see most often on your local news. The size of these voids ranged from medium to very large. This could mean that erosion has been happening for awhile. The depth isn’t too deep, meaning that there is a danger of collapse if it isn’t fixed. And finally, there isn’t any surrounding geology to keep the void from spreading to the surface. On the contrary, these voids were surrounded by limestone—which if you remember from our previous post—will continue to erode. Ok, you have your data and you know exactly where you need to drill. Let your professionals get to work! Depending on your void, property, and budget, your contractor may have to use some heavy machinery. To dig down into the hole, they may need to rent a drill rig and backhoe. Things may have to get a little ugly before patching up the hole. The sinkhole expert that we’ve talked to recommends filling the hole with large quarry rocks and gravel and then finishing it off with soil. Using large rocks will serve as a brace while allowing water to flow straight down through the earth. Your contractor should not use concrete to fill sinkholes. Concrete will concentrate water flow to the sides of the hole—which will only result in more voids in the future. Note: This article is a redux of a previous blog post, The 7 Most Common Signs Of Sinkholes & How To Test For Them, originally published Sept. 12, 2016.